Timothy D. Wadkins (PhD, 1988), professor of religious studies and theology at Canisius College in Buffalo, NY, has been awarded the Graduate Theological Union’s second annual Borsch-Rast Book Prize and Lectureship for his 2017 book, The Rise of Pentecostalism in Modern El Salvador: From the Blood of the Martyrs to the Baptism of the Spirit (Baylor University Press). The Borsch-Rast Book Prize is awarded to encourage innovative and creative theological scholarship by GTU graduates and current faculty and carries a prize of $10,000. 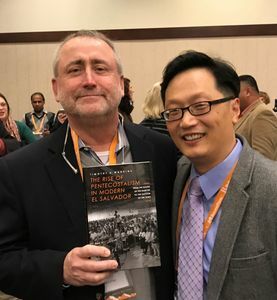 Dr. Wadkins’s receipt of the award was announced by GTU Dean Uriah Kim on November 17, 2018, at the GTU Alumni Reception during the 2018 Annual Meetings of the American Academy of Religion and Society for Biblical Literature in Denver, Colorado. A 1988 graduate of the GTU with a doctorate in Historical Studies, Wadkins will address themes from his award-winning book at the Graduate Theological Union’s second annual Borsch-Rast Book Lecture in April 2019. Dr. Ahn Q. Tran, associate professor of historical and systematic theology at the Jesuit School of Theology of Santa Clara University, received an honorable mention for his book Gods, Heroes, and Ancestors: An Interreligious Encounter in Eighteenth-Century Vietnam (Oxford University Press). While El Salvador remains predominantly Roman Catholic, more than 35 percent of its people are now evangelical Protestants, mostly identifying as Charismatic or Pentecostal. The country’s fast-growing Pentecostal movements are diverse, involving different social classes, the wealthy as well as the poor, women leaders as well as men, the educated and the uneducated. “Wadkins’s prize-winning book traces the Protestant-Evangelical renaissance and its deep interactive connection to modernization in El Salvador,” said Miles. The Borsch-Rast Book Prize and Lectureship was established to encourage innovative scholarship by GTU alumni graduates and current faculty. The $10,000 annual prize is funded by an endowment that was established by the sale of Trinity Press International, a venture dedicated to the publication of scholarly and often interdisciplinary theological studies. The prize and lectureship honor the joint example and collaboration of Frederick Houk Borsch (1935-2017) and Harold W. Rast (1933-2004). The Graduate Theological Union will begin accepting nominations of 2018 monographs by GTU faculty and alumni for the next Borsch-Rast Book Prize and Lectureship on January 1, 2019. Visit https://www.gtu.edu/academics/borsch-rast-prize-lectureship for more on the Borsch-Rast Book Prize and Lectureship, including contest guidelines and links to the online nominations form and video of last year's lecture featuring Naomi Seidman, Daniel Boyarin, and Judith Butler.